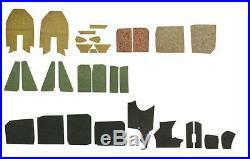 MK2 GOLF Sound deadening kit for under carpet, Mk2 Golf models 84-92 - 191863919. Sound deadening kit, goes under the carpet, may require trimming for fitting in G60/Rallye/Syncro, 23 piece kit using 3 different types or automotive felt materials. Mk2 Golf 84-92 Mk2 Jetta 84-92. For sales & customer services, call: 01273 440886. We always leave feedback after receiving your feedback. Whether you are in the UK or abroad you will receive the same great service. Opens in a new window. For news and special offers. The item "MK2 GOLF Sound deadening kit for under carpet, Mk2 Golf models 84-92 191863919" is in sale since Thursday, October 08, 2015.